Project #4 in the Great Cabinet Wait was refurbishing an old pedestal table we found on the side of the road. No joke. Dan and I were visiting his parents house one day and left to run a quick errand. We got a few houses down their street when Dan spied a gorgeous pedestal table in front of someone’s house, next to the garbage cans. I was looking out the other side of the car and didn’t see it. Honoring the pact we made that Dan would always let me know when he saw some wayward piece of furniture on the side of the road, he stopped the car and pointed in the table’s direction. I hopped out of the car and was in love with this table. It had four circular feet that connected into the one pedestal, which held up the table. It was exactly what I wanted for the kitchen seating area. I tried picking up the table, and it was heavy, indicating it was well made. Dan helped move the table on its side, and I saw a stamp that it was an Ethan Allen table! After a quick call to my father-in-law, he came out to help us take the table back to his parents’ house, where it sat until we were ready to start its make over. I’ll just cut to the chase (mostly because I don’t have a before photo). Here’s how the space looked during partially-complete phase, which also happened to be around Christmas-time). I originally planned to paint the feet and base white, and stain the top of the table a dark wood. Plans change though, as once I started sanding the top of the table, I quickly saw the top was not all wood. It was veneer. Boo. To make things easier for us, I agreed that the whole table should just be painted white. The table was the kind that opened to insert leaves, to make the table expand. The leaves weren’t put out with the table, which was fine by me, as we didn’t have plans to expand it. However, our first task was to caulk the two side together, to make sure they didn’t open. Once we did that, we got on to my favorite part, you guessed it, the painting. After sanding, many coats (there were a lot of little nooks and crannies in the table that were hard to reach we eventually just coated with spray paint), and applying a sealer, the table was ready to go. I had always wanted a built in kitchen nook, with bench seats that lift up for extra storage, but we were hesitant to build it until we had a better concept of how close the fridge would be to the seating area. We wouldn’t be able to physically see that until the cabinets were installed. 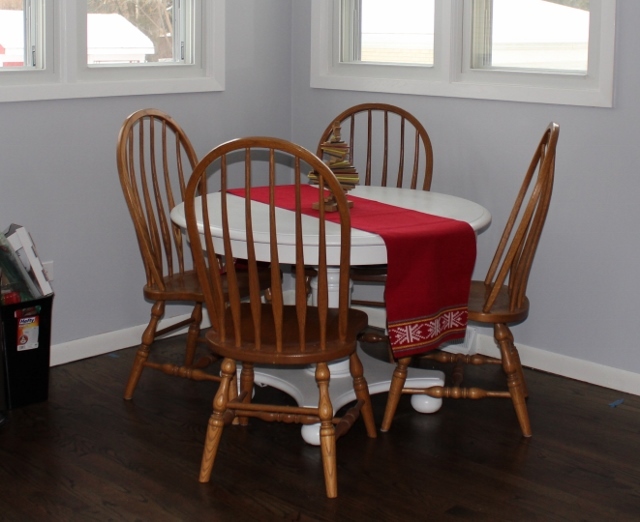 In the interim, we decided to just use some old Windsor chairs we had around the house for the table. I thought about painting them various shades of minty blue green, but we ultimately decided that since the chairs were a temporary solution, we didn’t want to invest any time (or money) into the just-for-now solution. A few weeks after using the wooden chairs, I spied these great Tabouret chairs on craigslist. Since the seller only had two left (she sold a set of two to a different buyer), she was sure she would have a hard time selling the two remaining chairs. We got the chairs for a steal – just $35 for the pair! Eventually, once the built in seating was complete, I knew we would only need the two chairs, so I was pretty excited for the great find. 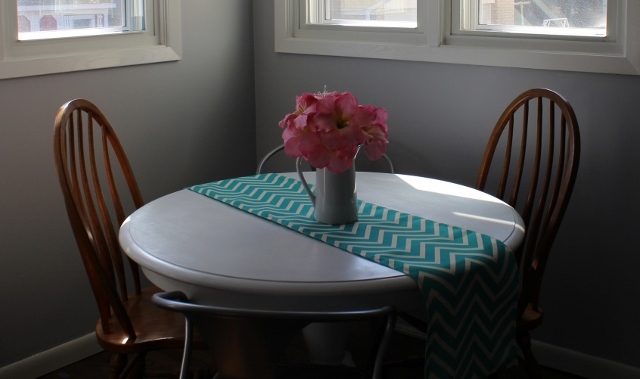 For the time being, I mixed the new chairs in with the old, added a chevron runner, and put an old ceramic picture filled with pink flowers on top of the table. We still had to wait for the cabinet installation to finish up the seating area…and to complete just about everything else in the kitchen. Sigh.